In this modern era where we are vastly engulfing the western traditions and where we are on the verge of getting westernized yet, there are few things that have not changed much and they may not change in the coming future too. Among these things lies a very vital criteria which we prefer not to change and are proud of. “The Indian Ethnic wear”, is what I am talking about. We may find women or a girl pretty in a short skirt or a hot pants or a backless dress but we only find a women or girl beautiful dressed in an Indian attire. Indian attire consists of sarees, salwar kameez, frocks, Anarkali, lehnga and etc. Today we are going to talk about lehengas. A Lehenga is a form of skirt which is longer and is embroidered and pleated which is basically from the Indian Subcontinent. Lehngas are called by different names in the different region of the country like Lacha in South India, Ghagra in Gujarat, Pavadai in Tamil Nadu and Chaniya I other regions. The lehenga has a come a long way down the history basically considered to be the more lavish form of Gharga and were basically worn by the Mughals. It was considered too special and was worn on special occasions. Few places in India are still very famous for the lehengas especially Rajasthan and Gujarat. Today they can be found and are worn in each and every part of India. The lehengas are the sanctuary of the Indian clothing and are kept on special occasions like marriage, parties and other celebrations. 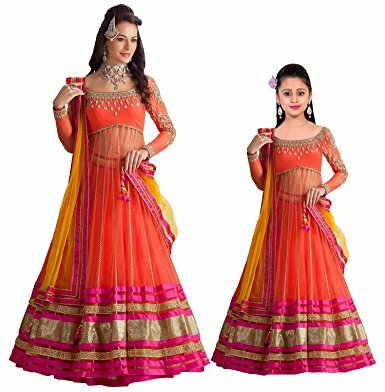 We can buy lehengas at many places locally or they are also available on the e-portals. There are shops which specialize in the lehengas and they only sell lehengas. I came across such a place online which specializes in ethnic Indian wear and lehengas. Craftsvilla.com is an e-portal where one can find ethnic, organic, natural, vintage and handmade products. They have endless variations and varieties in products and all the products are of the best quality. While going through the portal I came across their lehenga collection and I was latterly stumped. Lehengas has an entire section devoted to itself at the portal. They have a wide range of collection in lehengas. All right peeps, enough with the history lesson on lehengas and where they have originated from. We all know that the Indian festive seasons are just round the corner and the markets are going to all covered up in the festive colors very soon. So is Lehenga on your wish list this season? Well my decision on what to wear this festive season were so damn cloudy and my mind was a complete hey wire and finally everything was all clear when colors of lehenga bloomed my brains and I knew Lehenga is was going to be on this Diwali. I always wanted customized mother daughter attire for my three year old daughter and me. 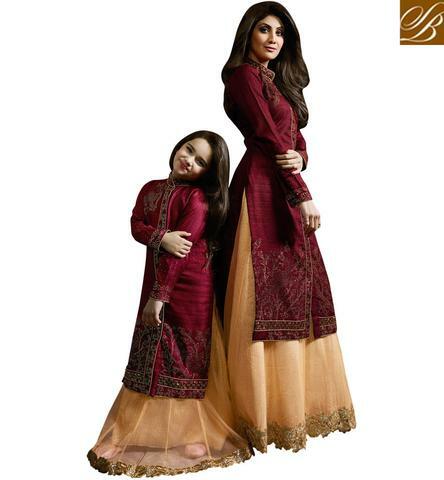 You may also have come across this beautiful combination of mother and daughter wearing the same kind of dress for a party or a special occasion so customized lehenga it is for me and my baby girl for this Diwali. Diwali being not too far like I said I am going to order my lehenga as soon as possible and if everything turns out to be ok I will surely share my Diwali lehenga swag with you guys.